With its origins dating back to the Paleolithic era, Etruscan Arretium was founded around the 9th-century BC, and quickly became one of the most important cities in Tuscany, playing an important role over the centuries due to its strategic position along the Via Cassia. Arezzo's most powerful period came during the Middle Ages, before the town was taken over by Florence, and even though much of the centre was destroyed during World War II, Arezzo is today a vibrant wealthy city with many exquisite monuments, churches and museums remaining, allowing visitors a unique opportunity to step back into the city's rich and colourful history. The Palace of the Lay Fraternity, or Palazzo della Fraternita dei Laici, is one of Arezzo's most famous sites. 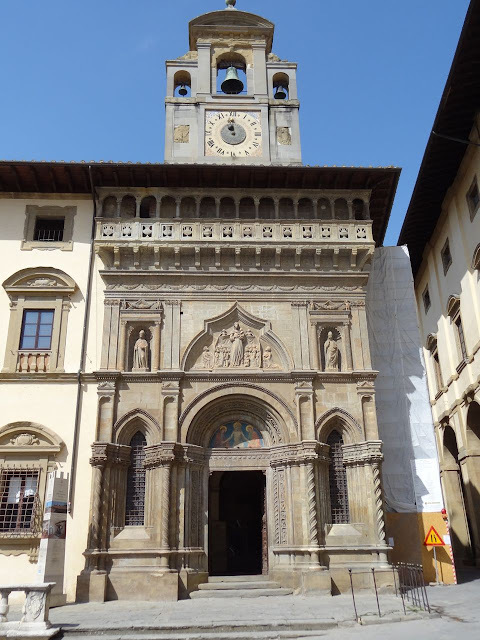 An elegant building built in the 14th and 15th-centuries by the Lay Fraternity of Santa Maria della Misericordia, a charitable body established by the Dominicans in 1262, the striking facade was begun in the Gothic style by Baldino di Cino in 1375, continued in Renaissance style by Bernardo Rossellino in 1433 and completed in 1460. The belltower was added by Giorgio Vasari in the 16th century. 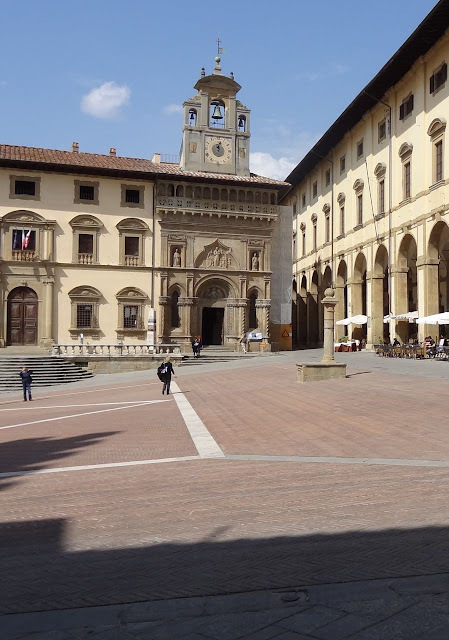 The palazzo houses the Sala della Quadreria, with many important paintings and historical documents that chart the history of the Fraternity. Upstairs the Sala del Consiglio and Sala del Primo Rettore house a picture gallery of Lay Fraternity benefactors, and original furnishings and artifacts of the time. 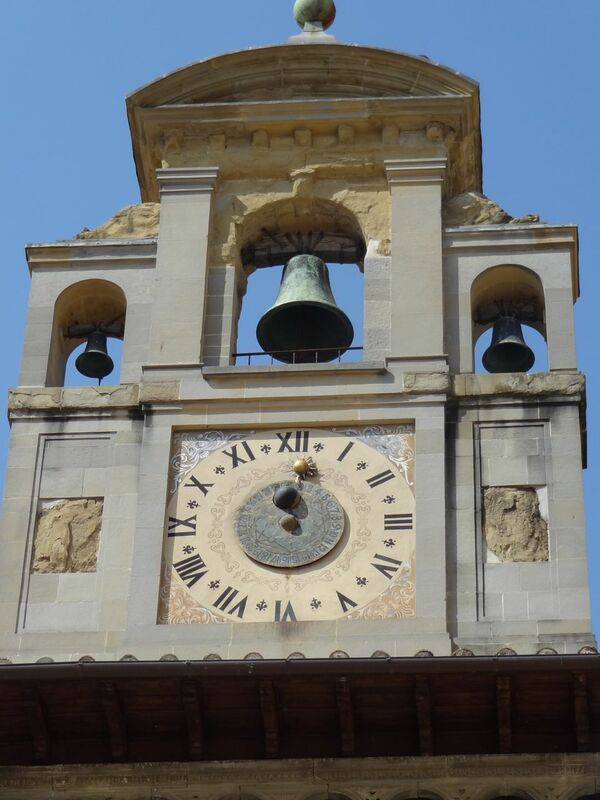 The highlight of the Palazzo is the 14th-century clock made by master clock-maker Felice de Fossata, and handsome bell tower designed by Giorgio Vasari. 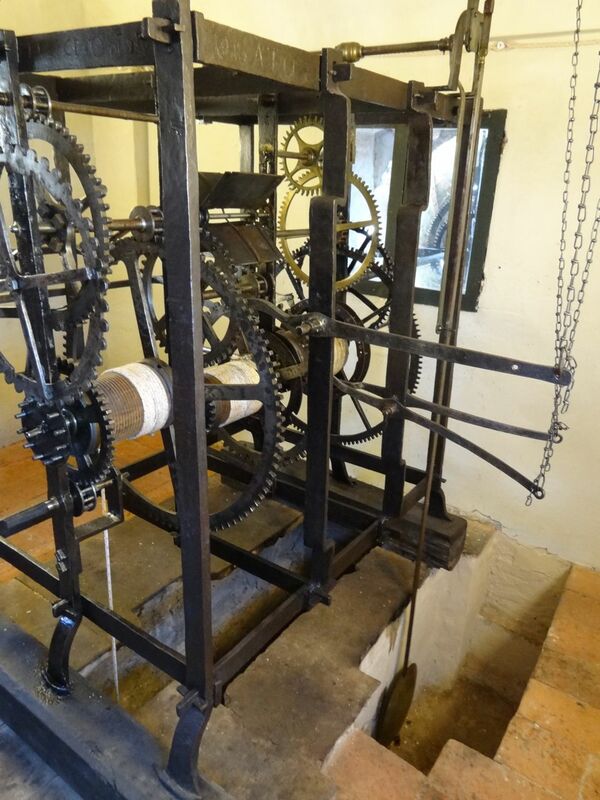 Centuries later, the complex mechanism of the clock is still working. One of the rarest in Europe, and the only one of its kind in Italy, the clock must be wound every day and operates by a system of stone weights on ropes. There is also an astronomical clock-face with the earth at the centre of the universe, and the sun and moon circling around it, according to the ancient astronomical concepts of Ptolemy and Aristotle. 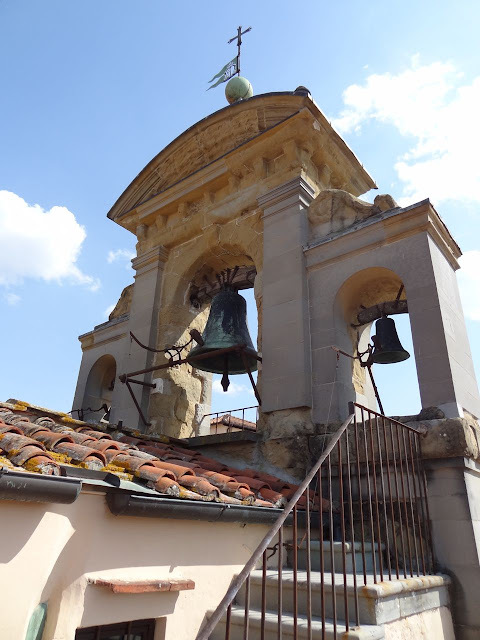 Standing in the bell tower as the clock struck noon, the wheels and pulleys started to whirl, and like Quasimoto, we heard and felt the vibration of the loud carillon of bells. 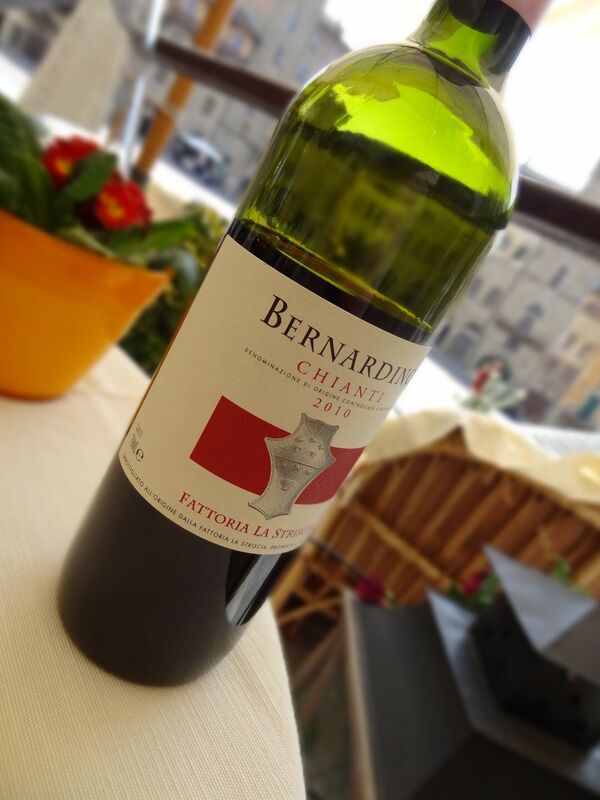 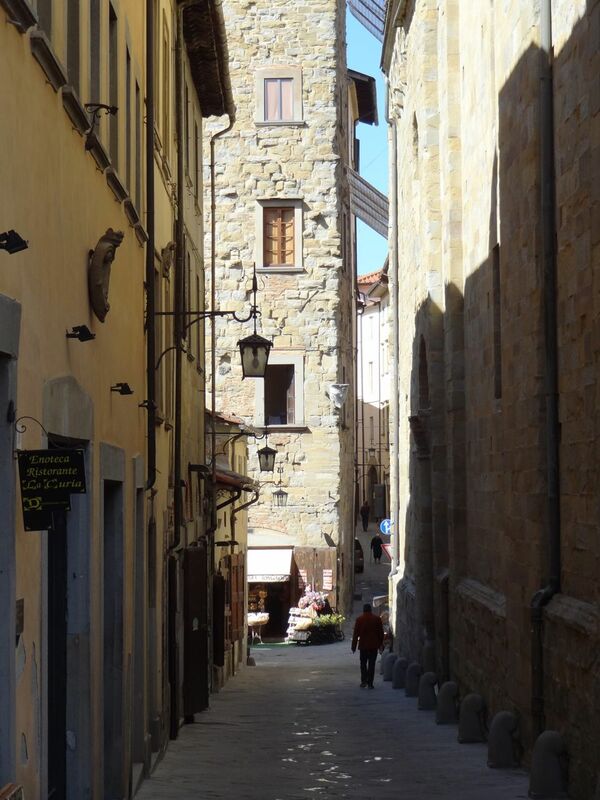 An extraordinary experience, it was a highlight of our day in Arezzo. 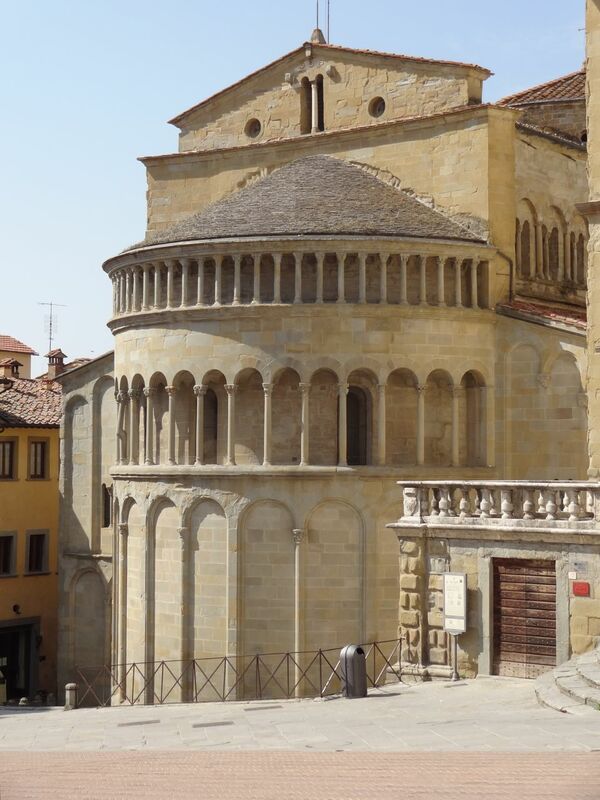 Santa Maria della Pieve is the main Romanesque church of Arezzo's central square, Piazza Grande, and surely the most picturesque in the city. 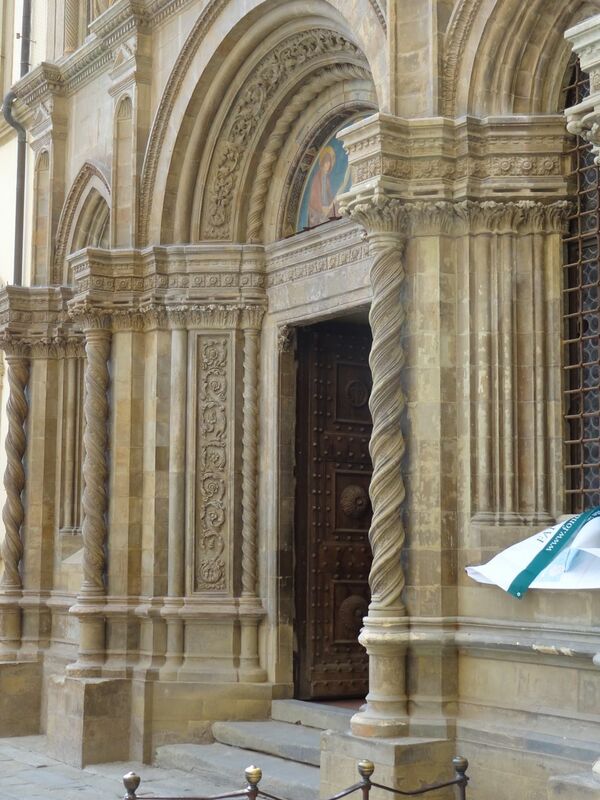 Dating back to 1140, the church was built on top of an earlier temple dating back to 1000 BC. 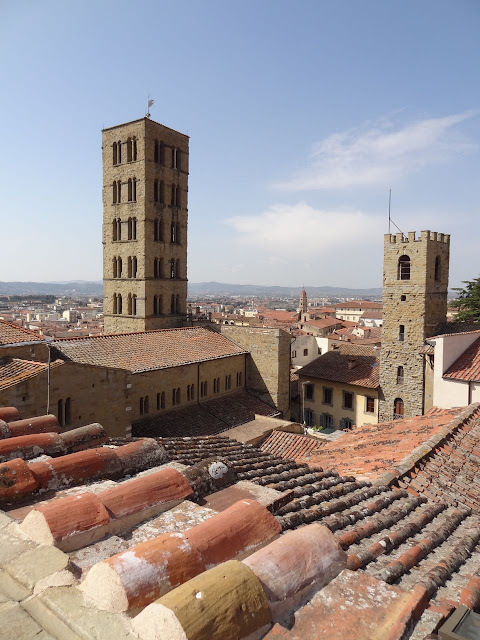 The church's majestic Romanesque façade with its 'delle cento buche', tower of the hundred holes, is one of the great symbols of Arezzo. 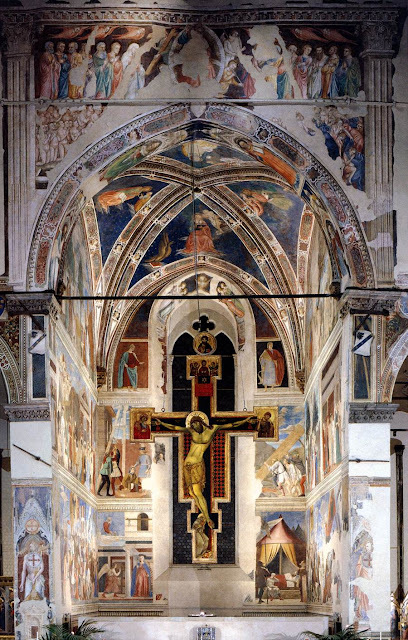 The city's greatest artistic treasure however, is Piero della Francesca's fresco cycle The Legend of the True Cross, located in the Basilica of San Francesco. Started in 1452, this early Renaissance masterpiece tells the story of the 'True Cross', considered to be Piero della Francesca’s greatest masterpiece and narrates a medieval story about the cross on which Jesus was crucified. 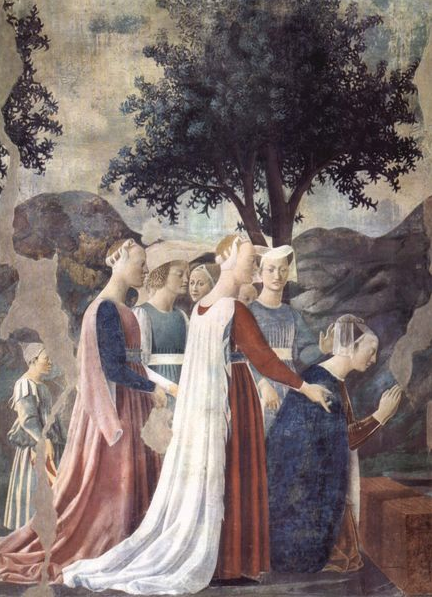 The work on a fresco cycle in the Cappella Maggiore had just begun in 1452 by the Florentine painter Bicci di Lorenzo, until his untimely death, leaving the chapel unfinished. Piero della Francesca then took over the project, and began covering the walls of the Gothic chapel with the most modern and advanced frescoes of the 15th century. 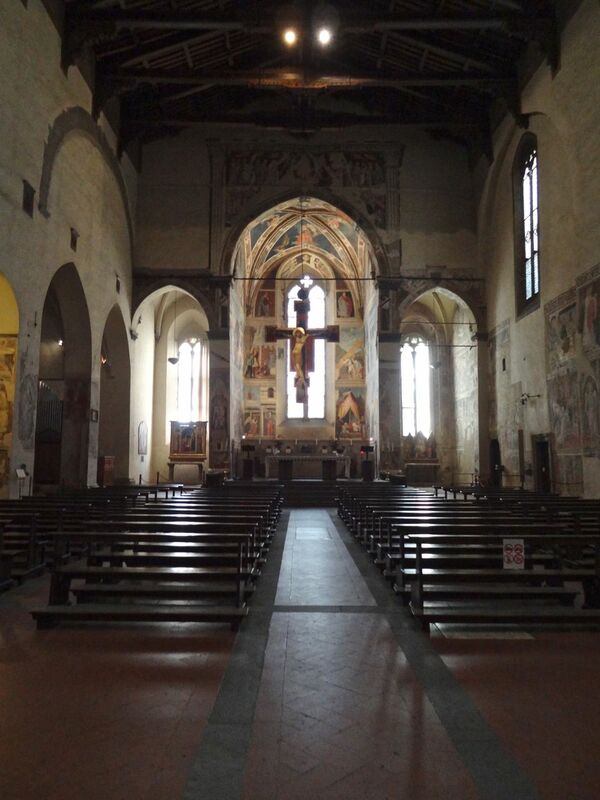 The interior of the Basilica looking towards the Bacci Chapel. 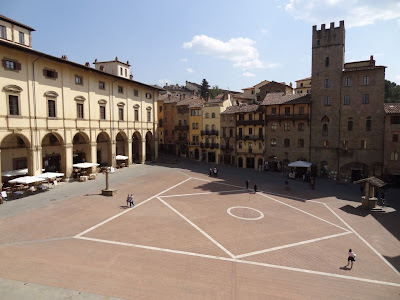 Born in the small Tuscan town of Borgo San Sepolcro, Piero della Francesca learned to paint in Florence in the workshop of Domenico Veneziano, during the mid-15th century. 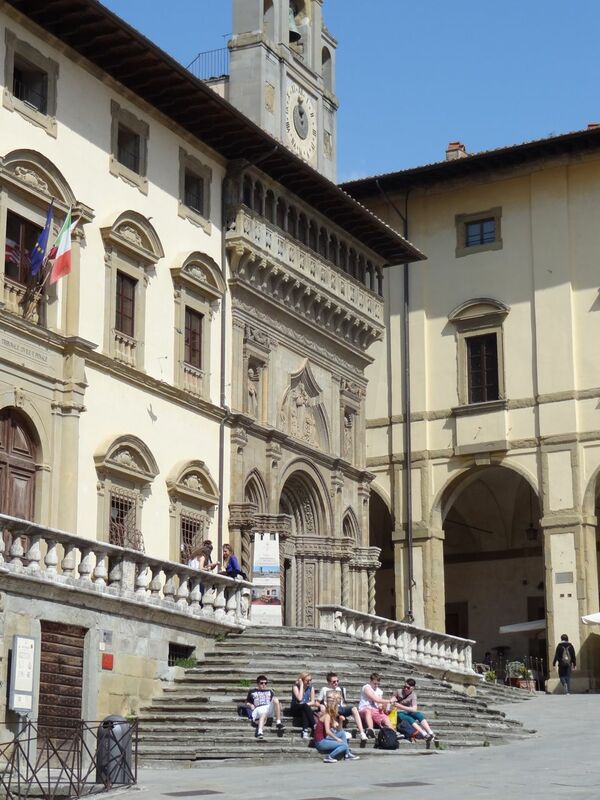 This was a period during which Florentine painters were learning to manipulate the principles of perspective, a technique that's evident in his True Cross cycle of frescoes. 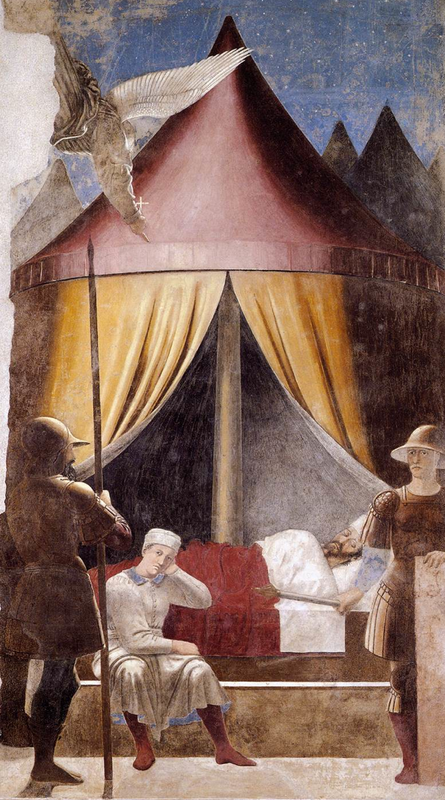 Piero was also a student of the effects of light passing over solid objects, which is most obvious in the fresco of 'The Dream of Constantine,' which studies the effect of light in a nighttime scene, but is also found elsewhere throughout the cycle. He was also strongly influenced by Masaccio and Veneziano. 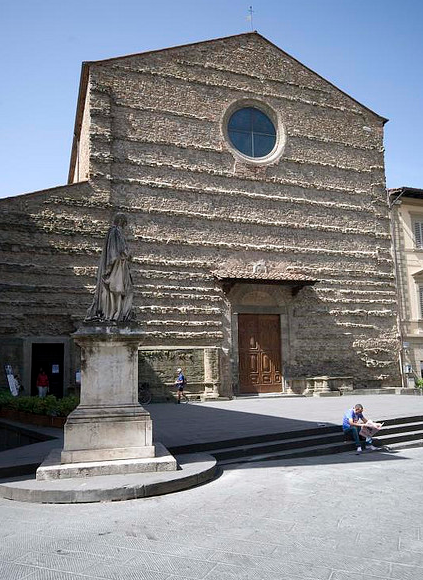 His solid, rounded figures are derived from Masaccio, while from Domenico he absorbed a preference for delicate colors and scenes bathed in cool, clear daylight. 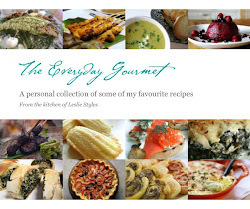 To these influences he added his own sense of order and clarity. 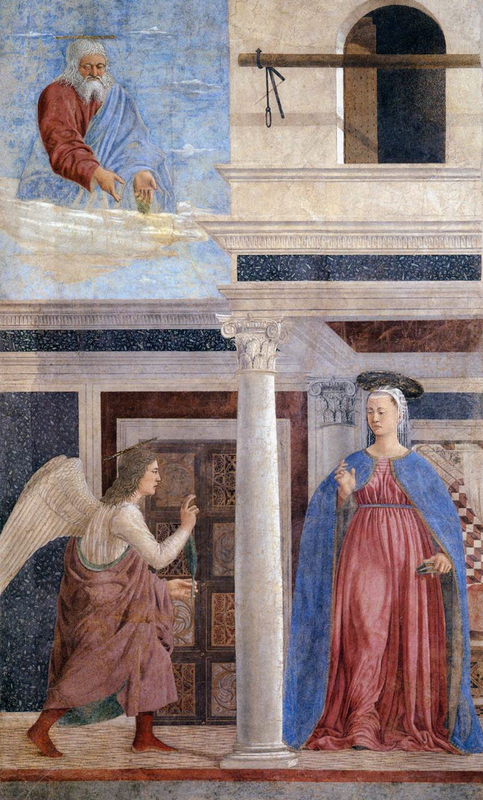 He portrayed the human figure with grace and precision, with an economy of line that seems very modern given that it was painted over 500 years ago. The story tells the legend of the cross used to crucify Christ, from sprig to Tree of Knowledge, to its use a bridge during the reign of Solomon, and ultimately its discovery by Helena, mother of Constantine, the first Christian emperor. 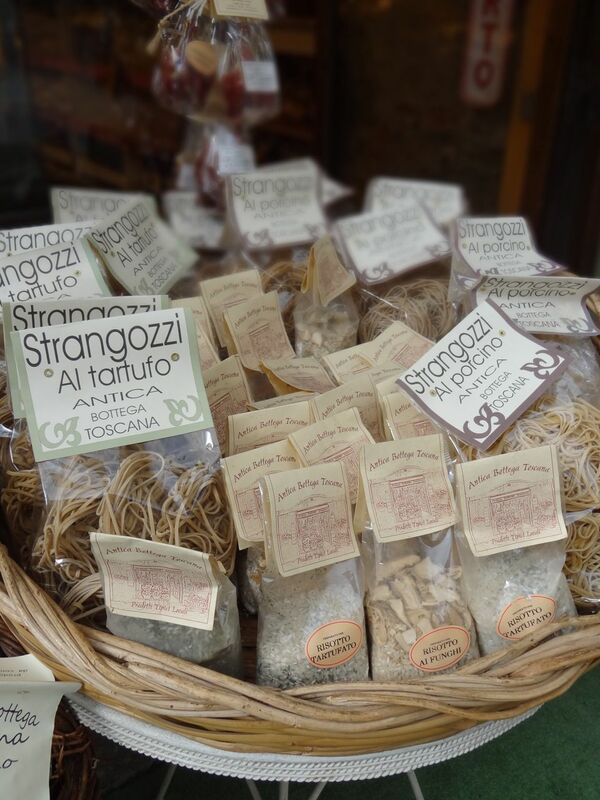 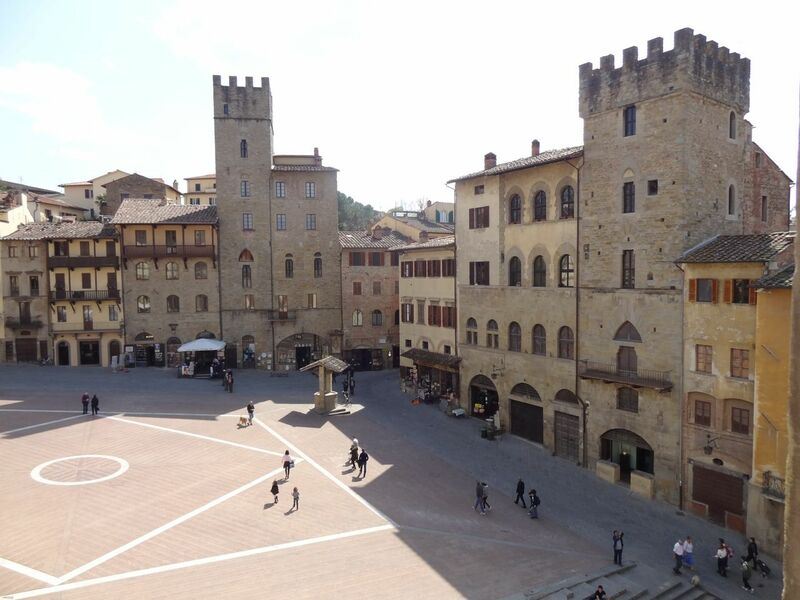 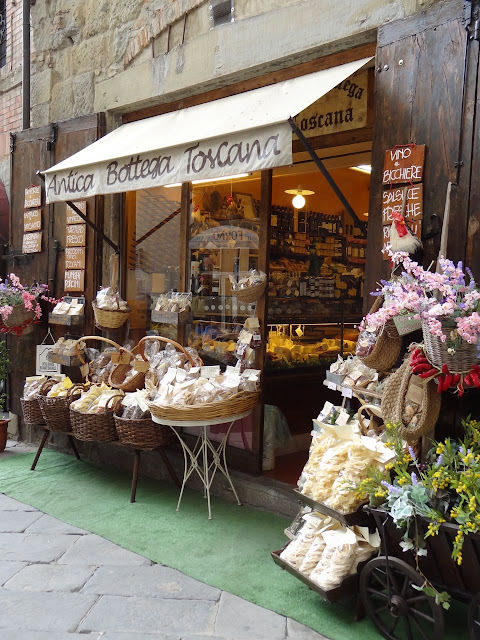 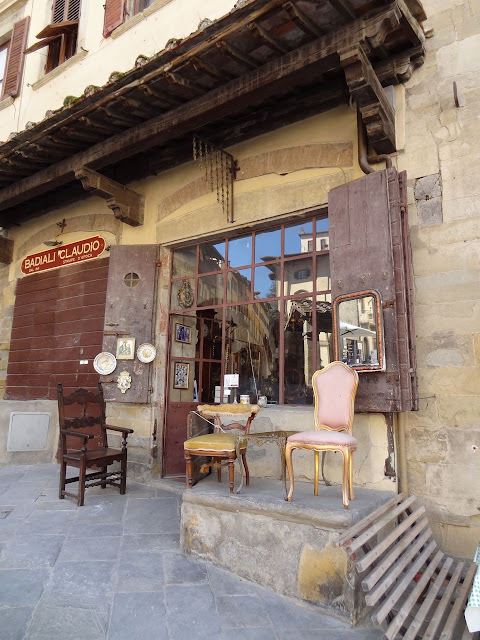 Arezzo is also also renowned for its antique shops and regular antique fairs which take place around Arezzo's central square Piazza Grande, on the first Sunday of every month. 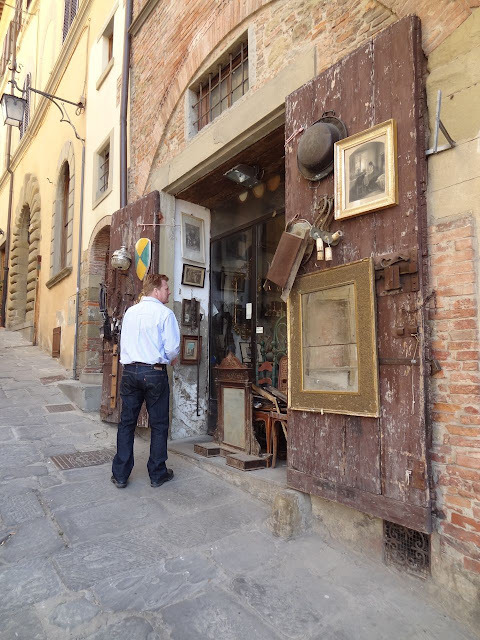 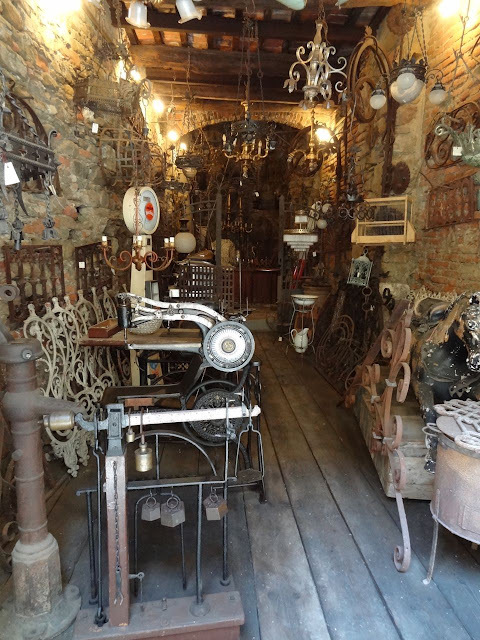 A haven for antique collectors, the warren of shops that line the winding streets of Arezzo, are almost worth spending an entire day to explore the many hidden treasures tucked away in the Medieval maze of the towns charming cobbled passageways. 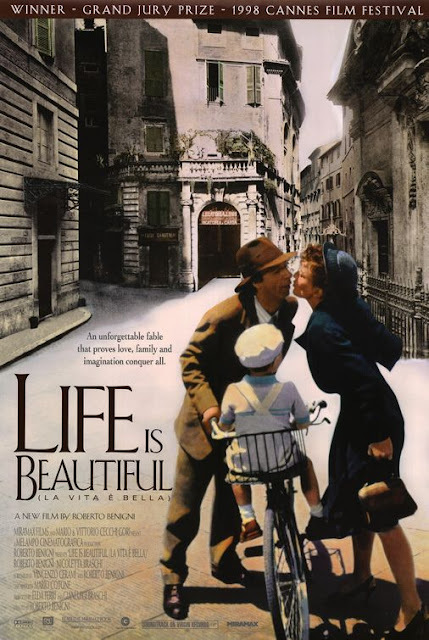 The Oscar-winning film, Life is Beautiful by Roberto Benigni about wartime Italy, was set and filmed in Arezzo. It would be fascinating to watch the film again, and perhaps catch a glimpse of the some familiar sites we saw of this beautiful Medieval hilltop town. 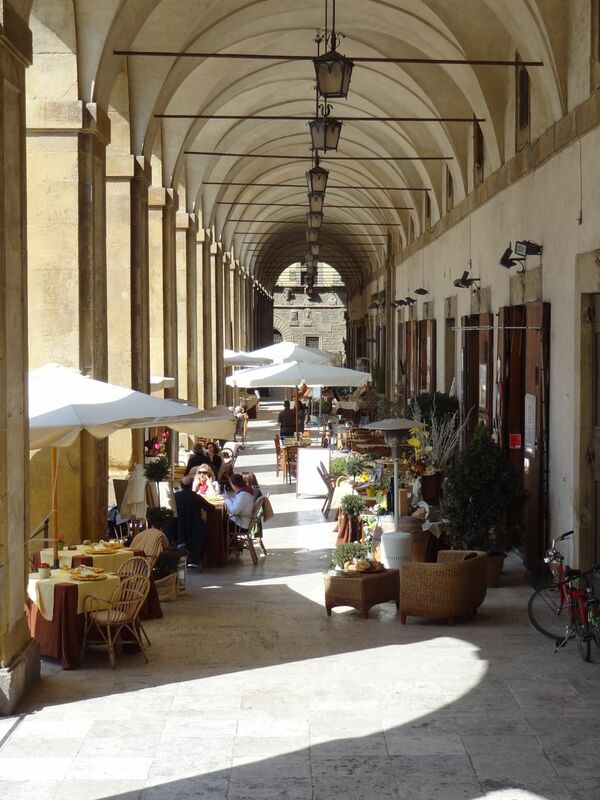 One of the more picturesque places to eat in Arezzo, is under the beautiful sun bathed Loggia designed by Giorgio Vasari. One of the prettier restaurants nestled under the vaulted colonnade is Logge Vasari, which serves traditional Tuscan and Arezzo cuisine and homemade pasta that's made outside on the Loggia. 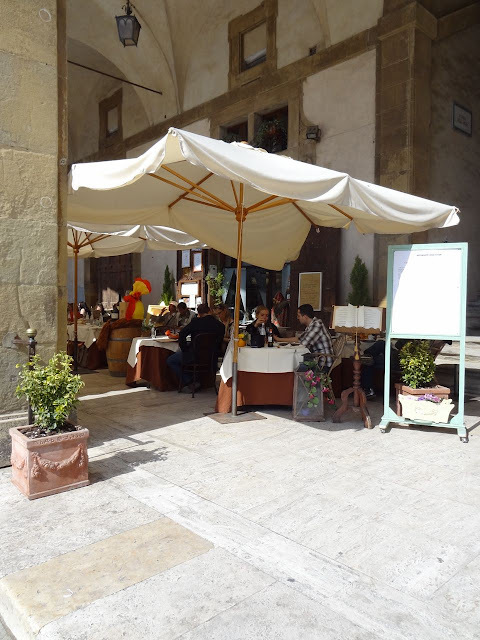 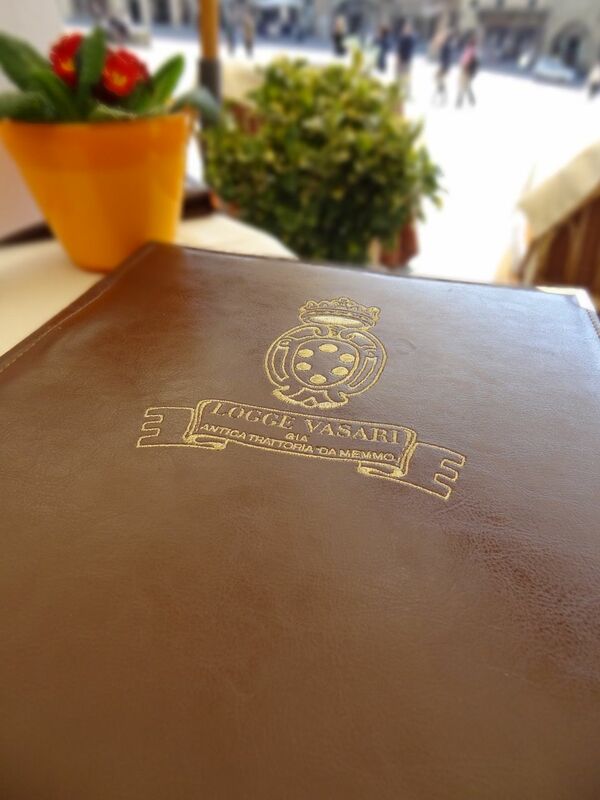 Run by the Fazzuoli family, Logge Vasari is a lovely restaurant with gorgeous vaulted rooms and original olive press, in the beautifully appointed upstairs rooms. 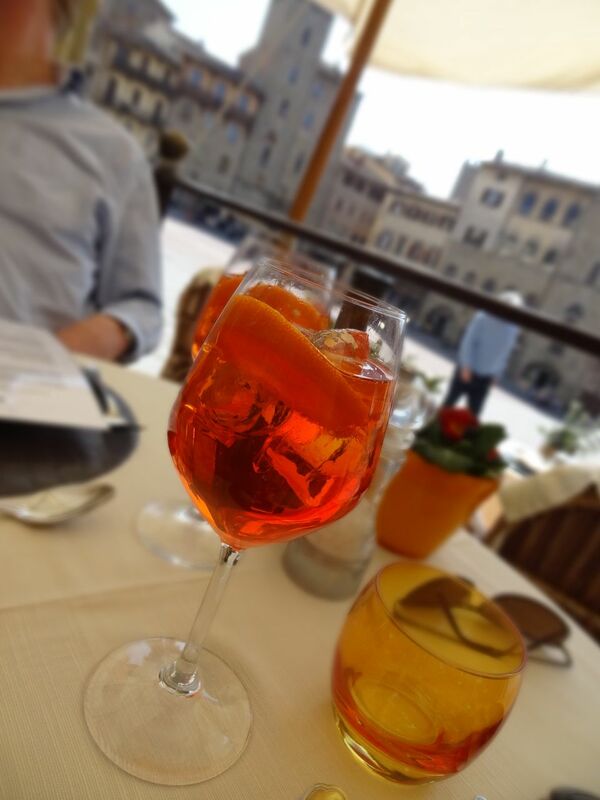 On this beautiful sunny day, we sat outside at a table overlooking Piazza Grande, sipping Aperol and Prosecco, and watching the pasta being handmade outside on the loggia. 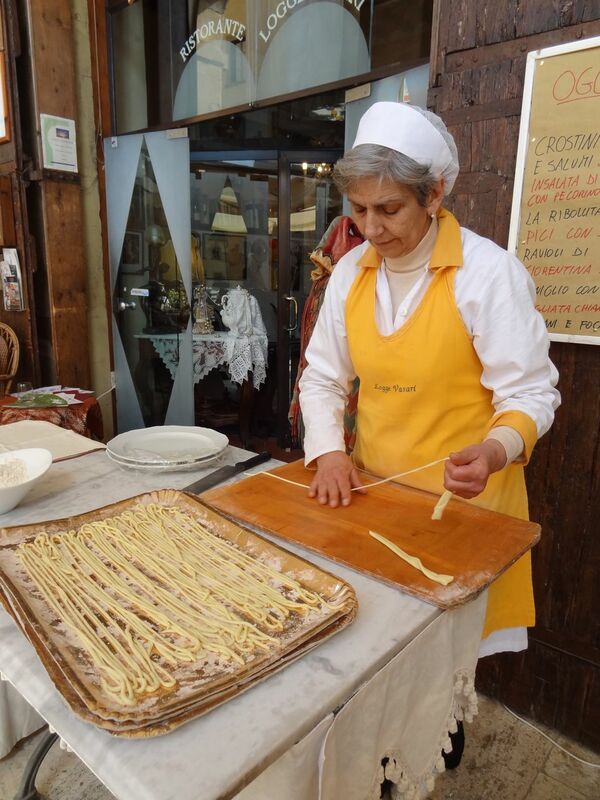 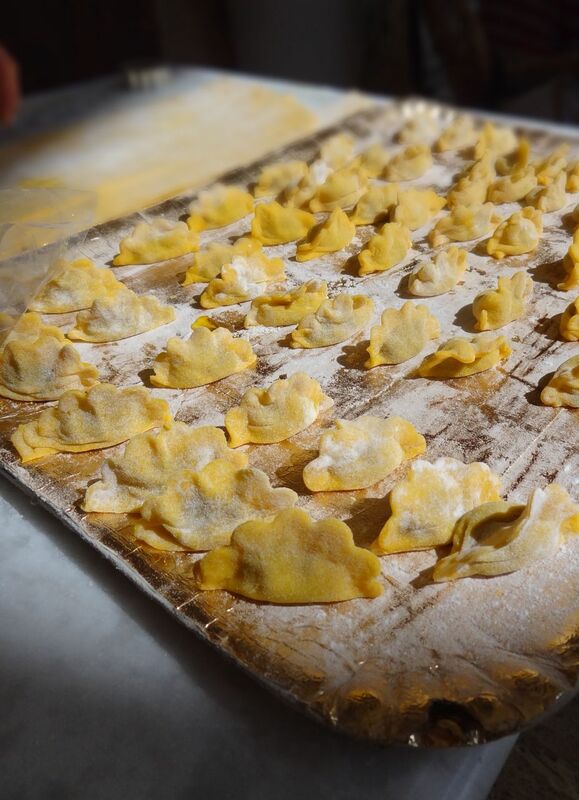 Having watched the pasta being hand rolled on a marble slab until it was paper thin, and cut into long thick strands of Pici, a traditional Tuscan pasta, as well as ravioli stuffed with artichokes, we had to try both of these dishes. 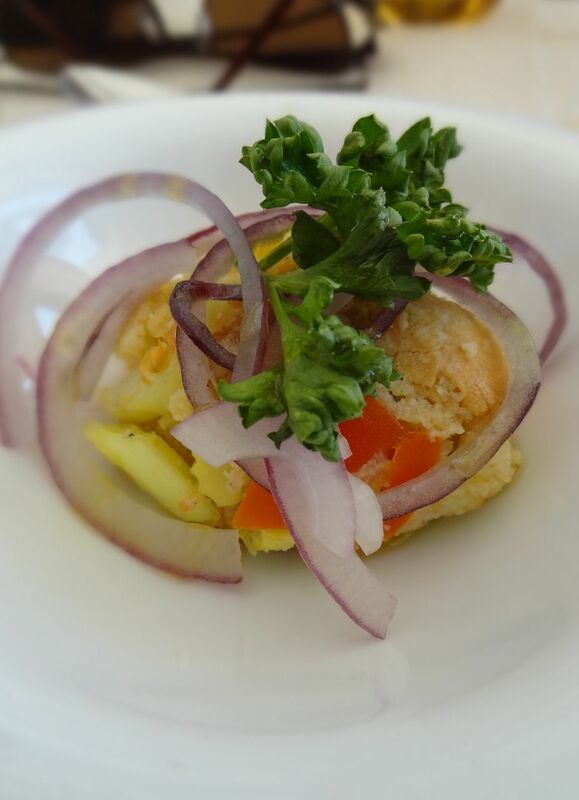 Starting with an amuse-bouche of cold polenta salad with leeks, tomato, celery, red onion and parsley, we followed with a delicious Flan di Pecorino Abbucciata su Crema di Porri, a pecorino cheese flan with puréed leeks and finished with a puffed farro biscuit. 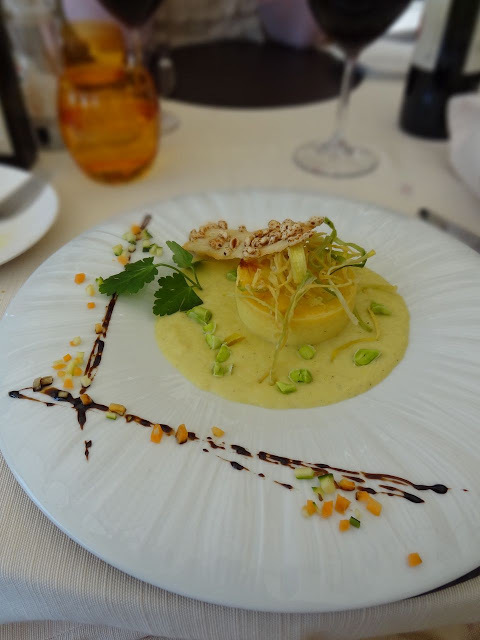 Light, delicate and richly flavoured with pungent pecorino, the flan was perfectly paired with sweet puréed leeks. Having not enjoyed an authentic yet since we've been in Italy, we decided to try the Pizza Margherita. 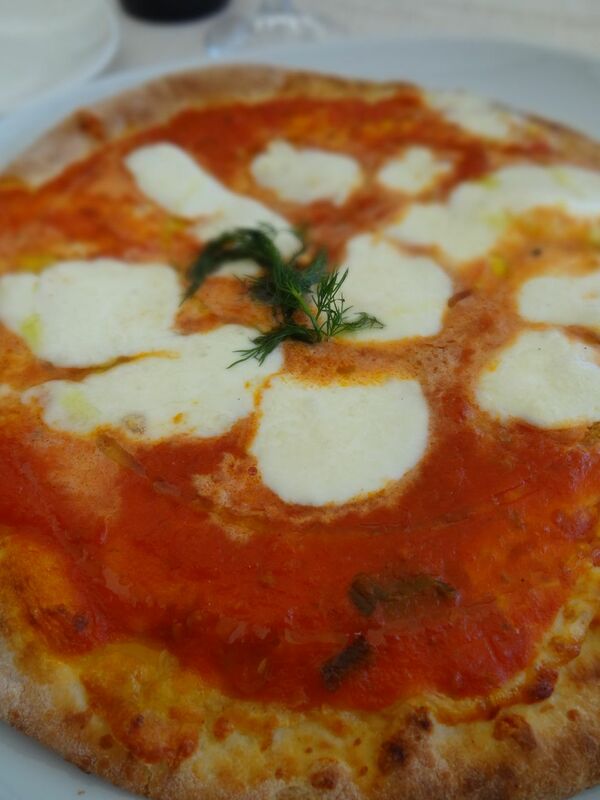 With a light thin crust, hearty tomato sauce and sliced bufala mozzarella, the pizza was worth the wait. 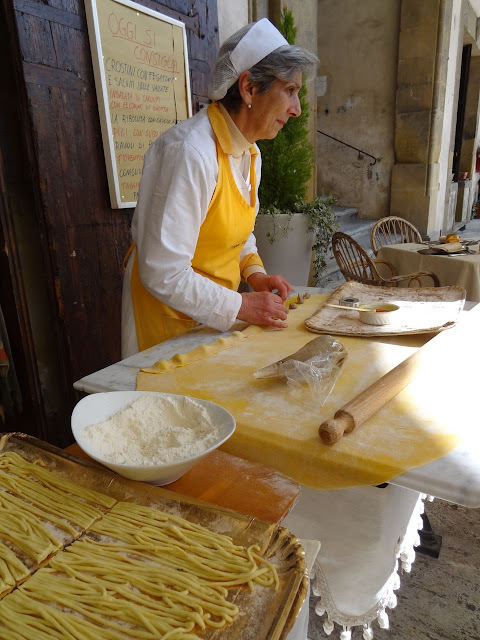 We then ordered the two pasta dishes that we'd watch being made earlier, the L'Amatriciana dei Ravioli con Carciofi and Pici con Sugo Oiantra di Antra. 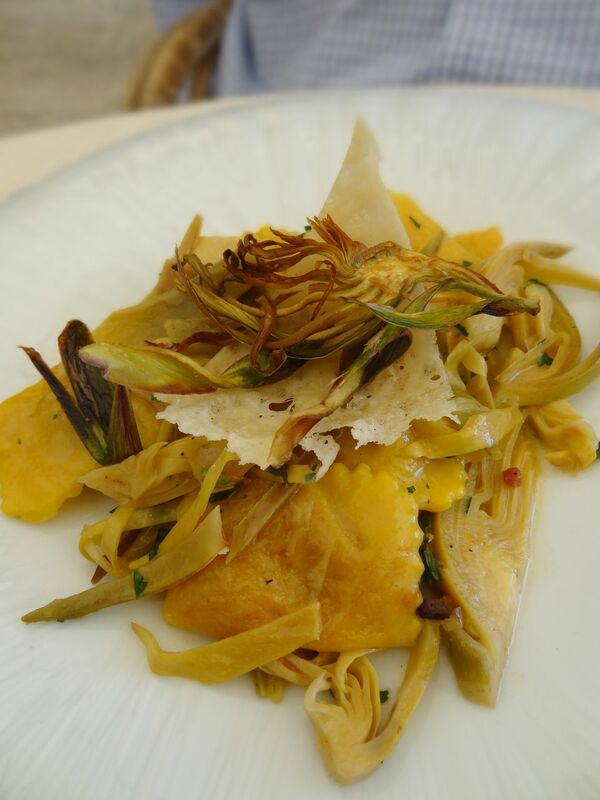 The ravioli, stuffed with cream of artichoke and finished with flash fried artichoke leaves and pecorino tuile, was just delicious. 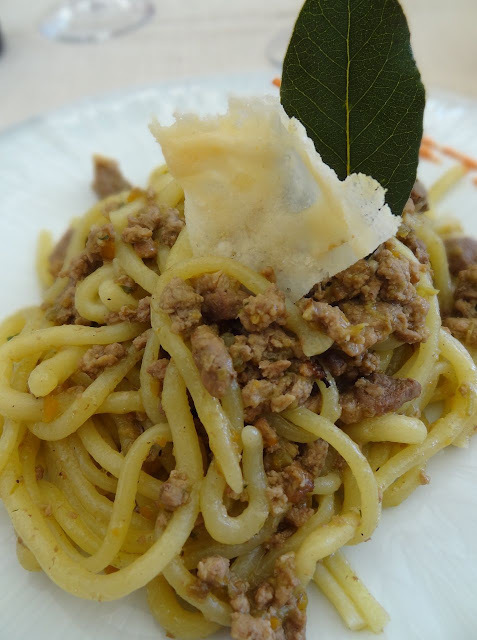 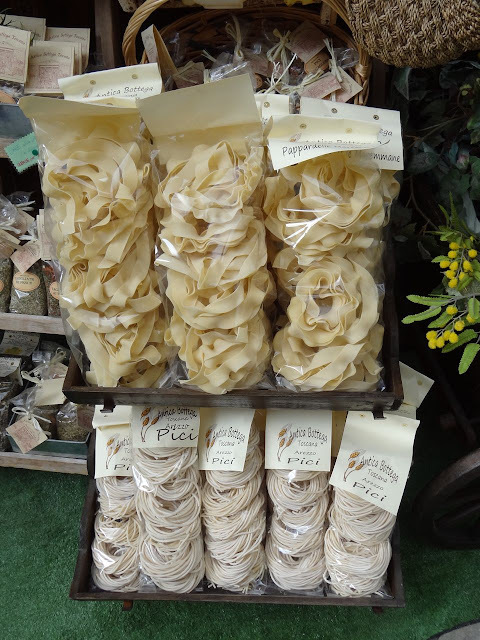 The homemade pici with duck ragu was light and full flavoured, and especially enjoyable having watched it being created.